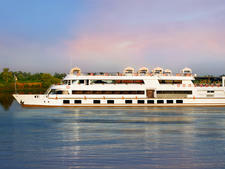 Sanctuary Sun Boat IV is the largest of Sanctuary Retreats' four vessels operating on the Nile. 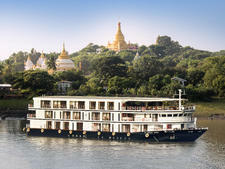 The 70-passenger boutique riverboat offers high levels of service with almost a 1-to-1 passenger-to-crew ratio. Sanctuary Sun Boat IV sails between Aswan and Luxor and offers three-, four- and seven-night cruises that are all led by experienced Egyptologists. 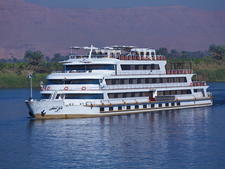 It is one of only a few Nile ships to visit the Temple of Hathor complex at Dendera on a four-night itinerary. Decorated in an elegant Art Deco style, the vessel has 40 cabins that are situated on four decks. The 36 standard cabins range in size from 162 to 207 square feet. The 10 cabins on the lower Nile Deck are the largest and have fixed windows that do not open. The 10 cabins on the Main Deck are 193 square feet, the 12 on the Bridge Deck are 180 square feet and the eight on the upper Promenade Deck average 162 square feet. All these cabins have panoramic floor-to-ceiling windows and French balconies. The vessel's two Presidential Suites, with balconies, are situated forward on the Main Deck and are both 468 square feet. The two largest cabins, the Royal Suites, are 592 square feet and occupy a prime spot at the front of the upper Promenade Deck with large private balconies. Staterooms are available in king bed or twin configuration, and standard amenities in all cabin categories include a mini-bar, a safe, a TV with movie channels, air conditioning, a hair dryer, an internal phone, quality Egyptian cotton bedding, bathrooms with shower, bathrobes and slippers. Additionally, all suites have bathtubs. The restaurant is on the Main Deck and has picture windows, leather chairs and walls decorated with hand-painted images depicting everyday life in ancient Nubia. It serves an American buffet breakfast with a la carte Egyptian items, a buffet lunch with a choice of Western and regional dishes and a served a la carte dinner. 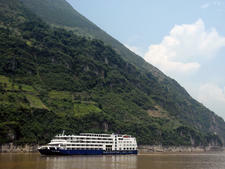 Meals include complimentary water, tea and coffee, and drinks packages to cover wine and beer are available. There is also a daily afternoon tea featuring a selection of pastries, cookies and fruit. The comfortable lounge bar is the heart of the ship and is also used for cultural events and entertainment, including cooking classes, belly dancing and whirling dervish shows. On each cruise, there is a colorful "galabeya party," where passengers have the opportunity to dress up in traditional Egyptian clothing and dance to Arabic music. Outdoor areas include a sun deck at the back of the Promenade Deck, plus the main Sun Deck which runs along the top of the ship and has loungers, a shaded area used for barbecues, alfresco dining and a heated plunge pool with an Egyptian marble surround and teak decking. Other facilities include a library, a gift shop, a spa treatment room and a small gym. Laundry service and Wi-Fi are available at extra cost.